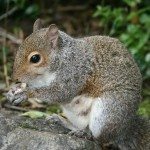 Will fencing a garden control squirrels if there is no fencing over the garden? Or can squirrels climb any type of fencing? You can use fencing, but you may need to electrify it (gives a mild shock) to keep them out.